My 2010 advice: Don’t bother. Unless you are 100% immune to poison ivy and get your jollies hiking through pancake-flat meadows and woods, there’s really not too much on offer here. Perhaps it’s better in the fall, I don’t know. I hiked this property on a steamy July 1st afternoon after a company outing down the road at the Farmington Club. And before anyone gets sore at me, I support the Land Trust 100% in their efforts and preserving this tract is absolutely the right thing to do. I can’t imagine driving around here and not seeing pristine meadows and farms. To the hike! There is a nice hiker’s lot right off of Tillotson Road (or you could start near the soccer fields on Old Farms Road too). I first hiked the yellow-blazed River Trail which skirts the meadows and then meanders along the banks of the Farmington River. (I’m now realizing some of my pictures make this place look kinda pretty – and it is, at least for the first quarter mile or so.) 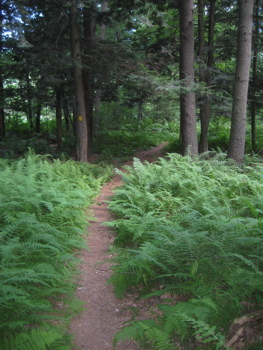 At the time of my hike, the trail was terribly overgrown with all sorts of stuff – both in the fields and in the woods. Once in the woods, the proliferation of poison ivy was, in a word, epic. At one point, I realized my shoe was untied. And after walking through a forest of “leaves of three” and “letting them be,” there was just no way I was going to touch my laces to retie them. After a while of that mess, I turned tail back to the road where my car was and retied them using a shirt between my fingers and the laces. Such is life. Across Tillotson Road begins the Canal Trail, which follows the path of the old Farmington Canal. So that’s cool. According to the map, there are a few loops here to be done, but none were marked at all in the woods and the intersection with some Avon Old Farms school cross country trails confused the whole matter. So I more or less stuck to the trail that paralleled the road a quarter mile to the east. If you MUST hike some Fisher Meadow property, I strongly suggest you do this half. 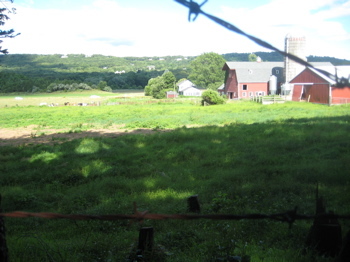 After a while, the trail turned into an old forest road and before I knew it I was behind a working farm – in Farmington! Aghast! The scene here is really quite pretty on a nice day but I merely turned around and retraced my steps back to my car. 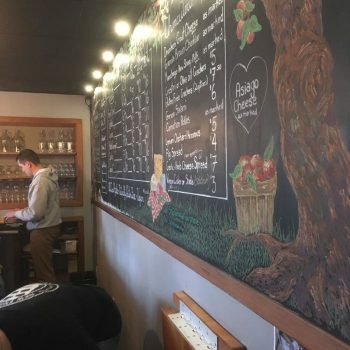 This property was acquired by the Town of Avon in 2002 for $2.1 million after receiving a grant from the State of Connecticut in the amount of $938,125 to assist in the purchase. An additional grant from the State was used to develop nearly four miles of hiking trails and install a gravel parking lot utilizing recycled processed material. 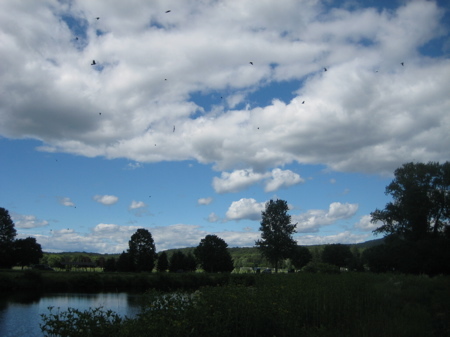 The eastern portion of the trail follows the Farmington River for approximately one mile, providing great access for walking, bird watching, and fishing. 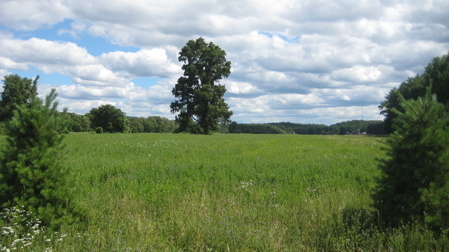 The southern portion of the trail offers a unique view of a significant glacial esker, a remnant of the last ice age, situated amongst the agricultural fields. The esker is also visible from Tillotson Road. 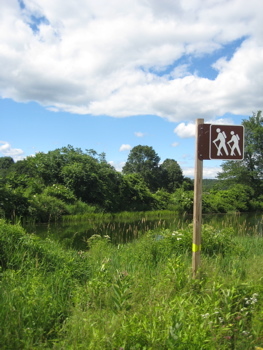 To the west of Tillotson Road, the primary hiking trail follows the historic Farmington Canal, which was completed in 1835 and connected New Haven with Northampton, Massachusetts. The canal was added to the U.S. National Register of Historic Places in 1985. Fisher Farm is an active agricultural operation producing dairy products and hosting a locally grown seasonal farm stand. 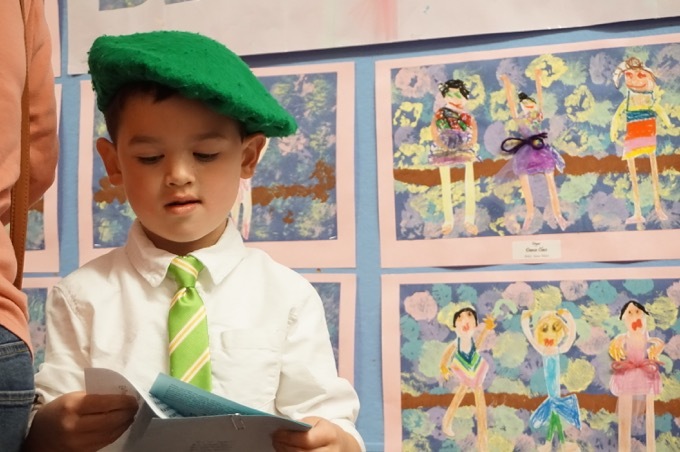 The operators also provide reasonable access to the farm for observation and learning experiences including many school visits and a number of community events. Because it is an active farm, visitors are asked to remain on the marked trails. In summation: Birding – great spot. Historic canal hunting – great spot. 2010 hiking: Not so great. Present day hiking: Probably much, much better – extended down in to Farmington for one completing the loop by the esker for another. This trail has just been extended another mile along the river into Farmington. The next phase will create a loop back to the Avon section of the trail. It will eventually connect to the Canal Trail on the West side of Tilloston Rd. 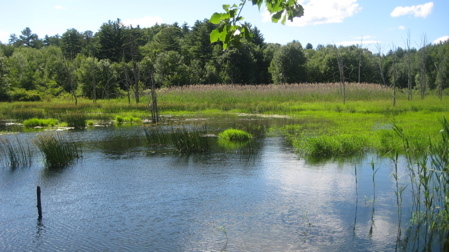 The Farmington section is called “Farmington River-Canal Path Hiking Trail”. It is my understanding that the original section of the River Trail has been re-cleared and blazed. I will wait for phase 3 to be completed and hike the big loop.